My fifth book for the 2011 Nordic Reading Challenge is my first stop in Norway. The book takes its title from the height above sea level (in metres) at which events unfold. During the worst snowstorm in Norwegian history a train derails and 269 of its passengers are taken to a nearby mountain-top hotel where they will wait out the storm in relative comfort. During the first night however one of the passengers is murdered and it falls to a couple of hotel staff and one of the passengers, former policewoman Hanne Wilhelmesen, to investigate. I admit to being a bit of a sucker for the ‘country house’ mysteries of which this is a variation. Over the years I’ve read the same basic story several dozen times because I like seeing how different authors try to bring something new to the much-used story arc, with varying degrees of success. I’d put this addition to the tradition at a little above average, with much to recommend it and a couple of things that annoyed me intensely. The positives first though, which included the characters. Hanne is very enjoyable, though I could be biased because I recognise my curmudgeonly side in her aversion to humanity in general. She is wheelchair bound since being shot on duty some years earlier and has withdrawn to a very small circle for her human contact (essentially her partner and their daughter) so dealing with the large group of passengers is something of a struggle for her. The fact that many of them want to help her (carry her, push her wheelchair etc) doesn’t improve matters as she has a real aversion to this. Although reluctant to become involved in the investigation and related matters that subsequently unfold, she does eventually take an interest in seeing whether or not she still has the skills to do the job that was taken away from her. The rest of the characters are more of a collective palette than individuals, though from this outsider’s perspective they provided quite a fascinating look at Norwegian society. Even Hanne at one point comments on this as she tries to work out whether or not they have a statistically representative sample of the country’s population. There’s a group of priests, s girl’s sports team, a group of doctors who’d been going to attend a conference (including one who is meant I think to be an exotic little person but whom I found annoying) and assorted others. The way they react to various events that occur over the time they are trapped together provides an interesting sociological backdrop to the book. The annoying things about the book mainly related to the uneven plotting. There’s a subplot involving people who had been travelling on the train in a locked carriage (rumoured to be the Royal carriage) and are now ensconced on the top floor of the hotel and have no interaction at all with the larger group. This thread balloons out to become an utterly ludicrous bit of nonsense that was entirely pointless and unnecessary and its inclusion made me cranky. 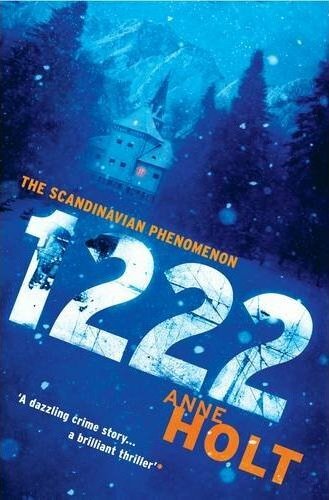 1222 is an enjoyable take on the classic whodunnit which nicely captures its stormy, isolated setting. For me the sensational (i.e. silly) elements of the plot detracted a little from my overall enjoyment but it’s still a recommended read. 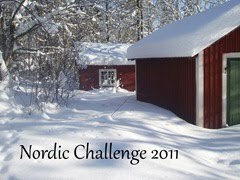 This entry was posted in Anne Holt, book review, Nordic Challenge 2011, Norway. Bookmark the permalink. Bernadette – Thanks for this great review. I like the premise of this one quite a lot; a group of disparate people who are more or less confined together does have appeal, doesn’t it? I think it’s because I like that “country-house” scenario, too. And the character of Henne seems interesting, too. Definitely one to consider adding to my TBR – and I just may forgive you for that ;-). Hanne Wilhelmsen is also the main reason that I enjoyed this one. I wish English readers could have access to Anne Holt´s first crime series, seven novels featuring Hanne. She was cranky and stubburn even from the beginning, but also very intelligent and nuanced, and in the 1990s this was one of my favourite Scandinavian series. @Belle I hadn’t planned on doing one but now you’ve given me an idea…shame I can’t remember all the ones I read before I started keeping lists but I’ll have a go. Great! I’ll be looking forward to it – it will be nice to read some really good country house mysteries. Please contact me for your prize.